Well after fending for myself and the dog for two weeks, my wife is back today and bought me a few pipes to play with. No high end pipes, but I think she still did good. 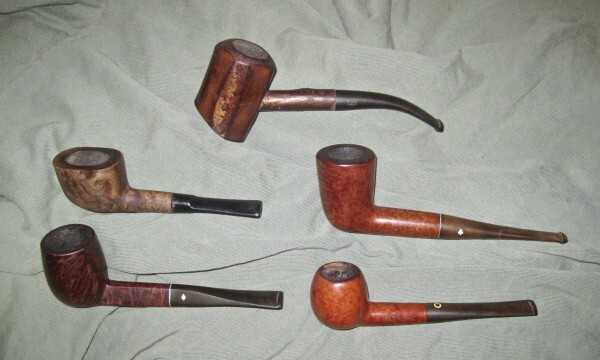 ($60 for five pipes) She found a Ropp Cherrywood, Dr. Grabow Starfire, Kaywoodie Super Grain, a Yello-Bole, and an odd little pipe simply stamped Vest Pokit. They all seem to be older pipes too. I'll have to post some pics later when I get them cleaned up. Nice haul fair play to Mrs Orley. Love those old American (US) factory pipes, like U.S. cars from the fifties. Those will spruce up nicely. No worries reddog, the dog lost a little weight because I don't give him people food or as many treats like my wife does. She found these in a large antique mall in downtown Chico. California not Canada. It was better when state abbreviations were 4 or 5 letters. She's a wonderful woman, Orley! Nice finds, on her behalf, and for you. Nice lady! I'm in the process of trying to convince my girlfriend to get me something pipe or cigar related for Christmas. Can't wait to see the pipes after they're freshened up! That Grabow is going to look amazing once you give it a little tlc. Actually, the one I was referring to maybe the Kaywoodie as I get my stamps mixed up. The one I love the look of is the one second row on the right. Orley, which one did your wife say SHE wants?....I've got a Ropp just like that one...it smokes like a charm..
kind of a conical chamber...and I like to burn VA in it...and the Grabows will be nice too...all in all, you did get some decent smokers to mess with...as if you needed them, eh? newbroom, I would never admit to not needing any pipes! 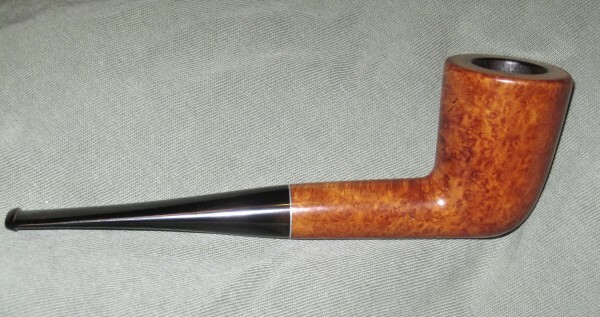 I cleaned up that Kaywoodie, and am smoking it now. Really nice pipe, except the stinger has been cut off. As far as I'm concerned, unless it's a rare pipe, I would rather not deal with the stinger anyway. I'll post some pics tomorrow. By the way, my wife likes the little vest pokit pipe. Yes, that's how it's spelled. She's got a very good eye! Great score! I am sure they will all smoke superbly. You are a lucky man! Your wife is awesome. I got the Kaywoodie done and after sanding all the gunk off the briar it needed a little light coloring. It's a little oranger than original. The bowl had some pretty bad charring, and was rounded off at the front and rear. I topped it just a little and left it with a slightly rounded outer edge all around. Man, this pipe has a large bore. I managed to stuff a doubled over pipe cleaner all the way to the bowl, so it has a really open draw. 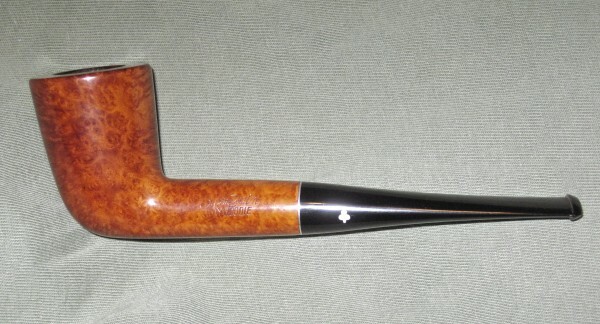 Nice older pipe, Super Grain over Kaywoodie, with some nice birds eye.